The Cavaliers lost again (90-86) to the Celtics in their third preseason game and again no Ben, Sasha and Delonte. After trailing to the Cavaliers 81-74 early in the fourth, the Celtics were able to rebound and win led by Leon Powe with 17 points, including the go ahead basket with just two minutes left in the fourth to put the Celtics ahead 85-84. Lebron James had 12 points in 18 minutes and Daniel Gibson led the Cavaliers with 14 points. Jawad Williams added 13 points and Zydrunas Ilgauskas had six rebounds. 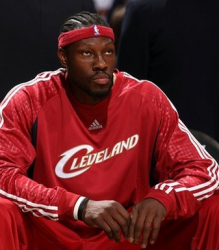 Ben Wallace has been dealing with stiffness and soreness with his back and the team is already showing some concerns. It caused him to miss three practices last week and kept him out of the game against the CelticsÂ and didn’t travel with the team. Sasha Pavlovic sat out a second straight game with a sprained ankle but he took part in shootaround. Delonte West is still absense for personal reasons.